Are these coming with a double sided sticker on the back? I don't want to drill it on the tiles. Thanks. These come with screws unfortunately. Although, maybe you could try using the sticky fix tabs (code: 34881), these could work if you use quite a few as the dispenser will be quite heavy when filled, although we have not tested this so cannot guarantee. 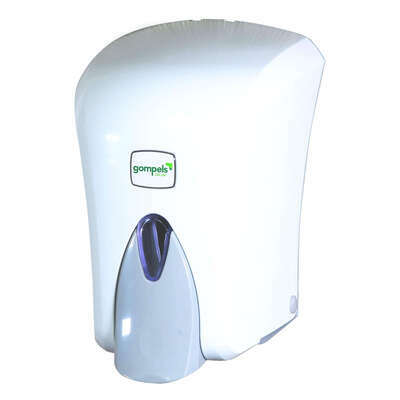 This Soap Dispenser has been designed to offer high volume service in all work environments. The sleek and contemporary design has been crafted from durable ABS plastic and has a smooth surface to eliminate the potential sites for bacterial growth. Internally, the dispensing mechanism released a measured dose of soap at each use to help reduce waste. The large capacity allows this device to hold 1000ml of your chosen soap at any given time which helps to reduce the number of re-fills required over time. This reservoir can also be removed and cleaned in the dishwasher to prevent product build up. Curved design minimises bacteria growth sites and supports effective infection control. If you're looking for a smaller capacity, we also stock this dispenser in a 500ml option.